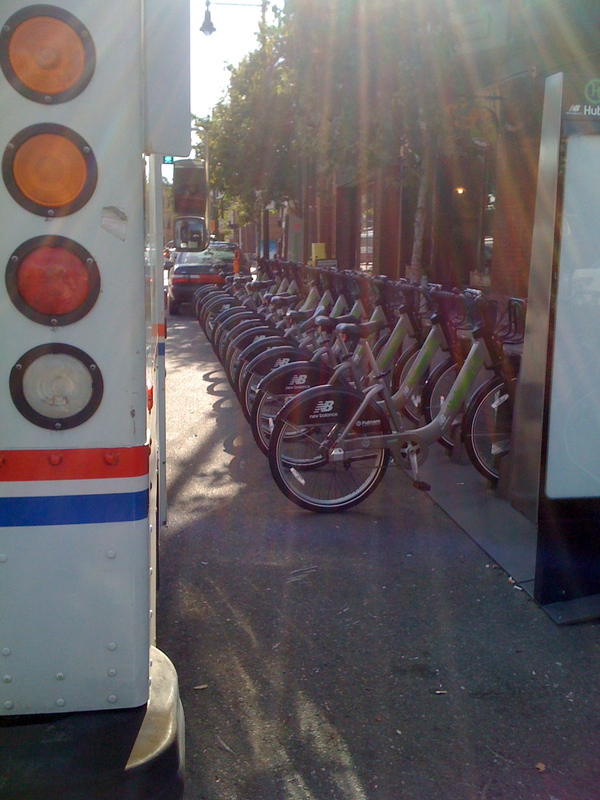 I was in Boston last weekend and while I was there had the opportunity to use Boston’s bike share system, Hubway. To paraphrase some of the language from the announcement of New York’s bike share system, it was an affordable, easy, and fun way to get around the city. I spent five dollars for a “Casual 24-hour membership”, which was enough to get me from South Station to a friend’s apartment in Mission Hill and to countless points in between my arrival at on Saturday afternoon and my departure on Sunday. As a comparison, base fare on Boston’s T is two dollars. “We love them,” she replied. I was actually surprised by the level of her enthusiasm and asked how she felt about losing two parking spaces, the kind of street change that would cause apoplexy among the Sean Sweeneys of New York. “Parking in this neighborhood is terrible,” she said. “People know that about Mission Hill and don’t come here, because they know they won’t be able to park.” She explained that two fewer parking spaces wasn’t going to be the deciding factor in someone’s choice between driving to eat at her restaurant or going elsewhere in Boston. Parking for over a dozen bikes, on the other hand, seemed to have made a difference in the short time since Hubway launched this summer. She told me that ever since the bike sharing station went in, people were riding in from all over, and the ease of using a Hubway bike may have had something to do with it. “There’s room for twenty bikes or two cars,” she told me. “You do the math.” It seemed her enthusiasm for the project had inflated her mind’s estimation of how many bikes were parked outside. I asked her if she had noticed any change in her business and she seemed to exhibit the kind of understanding of basic economics one could only hope for in the New York business owners who claim that bike lanes killed their stores’ profits. 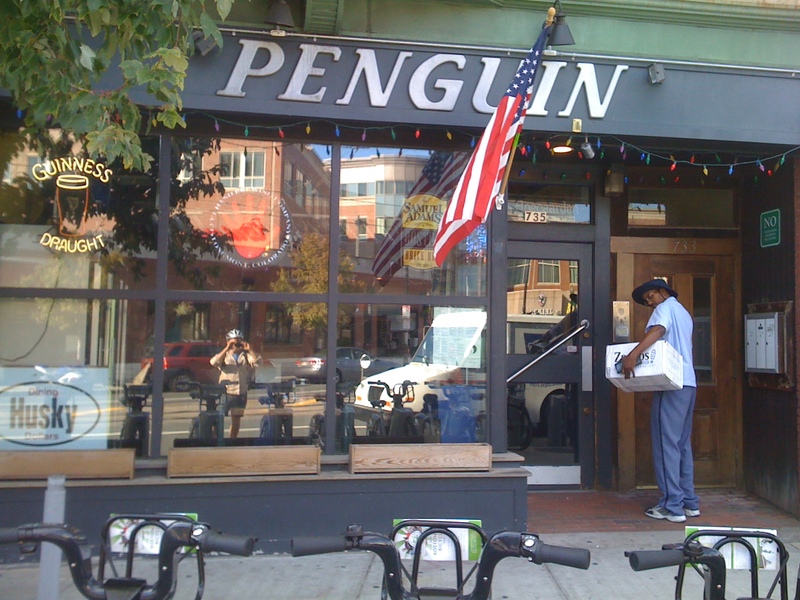 She said that there was no real way for her to make a connection between the bike share station and her profits; Boston’s economy — especially the economy of bars and pizza joints — is very dependent on students, and most schools were only just finishing their second week of classes. Still she said there was absolutely no way the bike share station was hurting her business. Boston is by no means a logical location for a biking boom, but it’s booming nonetheless. With roads that were laid out not by a Commissioners’ Plan but by cows and sheep, its traffic can often be worse in some areas than in the five boroughs. The weather is less favorable than ours by a matter of degrees, and there’s an even deeper history, entrenched political interests, and neighborhood-based identity in Boston that can make change difficult or even impossible. As New York rolls out its bike share program in April 2012, it’s clear we have a lot to learn from our baseball rivals to the north. If bike share can make it there, it can make it anywhere. I have to admit I was skeptical about this- I thought that the only people who would be willing to bike in Boston were people like me who were already commuting and therefore had their own bikes. But I went ahead and joined, almost as a charitable contribution to support a good cause. Interestingly I see a lot of professional people in my area using it, and a ton of tourists. I myself have used it probably 10 or 12 times in the month or so it’s been running- mostly if my bike has a mechanical problem, or if I’m sick (this week), or for some reason not feeling like riding the 6 miles into work. When I use it, I mostly use it as a last mile solution in combination with the train, but I’m planning on using it today at lunch to run an errand. I get a lot of interested questions and so far zero harassment while using them, which is encouraging. I know exactly how you feel. I’m car free/care free, always have my trusty folding bike within 50 feet of me, and am lucky enough to work for an organization that lets me bring my bike up to my work space. I joined for charity too. So on Day Two of Hubway, I was surprised to find a use case for Hubway – with my own bike not 5 feet from my desk. Had an errand to run, and two, one-way trips on Hubway was better than my bike insofar as I don’t have to worry about the bike once locked into the kiosk. I’ve used it a lot since, and frankly (probably in violation of the terms of service) have loaned it out to 3 different friends, one of which has since signed up.